Transformer oils serve several functions. They provide dielectric strength, protect the solid insulation and facilitate heat transfer. Perhaps most importantly, they also offer a way to determine if a problem exists when looking inside the transformer. While several different dielectric fluids are used in transformers today, by far the most common are mineral oils. Of these, the majority are of naphthenic base stocks. Generally speaking, naphthenics have a lower natural pour point and a lower viscosity index (VI). Obviously, the lower pour point is beneficial for the lower temperatures found in some climates and during the winter months. Due to the lower viscosity index of naphthenic base oils, a rise in temperature has a greater effect on the viscosity of the oil. As the temperature increases, the viscosity decreases and the heat-transfer rate is improved. For oils of equal viscosity at 40 degrees C, the heat-transfer coefficient can be 8 to 11 percent greater for a naphthenic oil than for a paraffinic oil. As a mineral oil, the transformer oil’s usable life can be optimized if it is kept clean, cool and dry. Upon receipt and prior to use, these oils should be tested for particulate and water contamination among others using the following tests: acid number (ASTM D664), dielectric breakdown voltage (ASTM D877), liquid power factor (ASTM D924-08), interfacial tension (ASTM D971), specific resistance (ASTM D1169), corrosive sulfur (ASTM D1275), visual examination (ASTM D1524), Karl Fischer water (ASTM D1533), dielectric breakdown voltage (ASTM D1816), gassing tendency (ASTM D2300), oxidation stability (ASTM D2440), gas chromatography (D3612), oxidation inhibitor (ASTM D4768 or D2668) and particle count (ASTM D6786). These tests will determine whether you are receiving clean oil and will establish a baseline of the oil properties that should be tested periodically. Although there are a number of tests to which the oils can be subjected, some are quite expensive, so they may be best used as diagnostic tests if an issue is indicated in more routine testing. 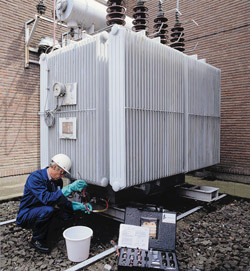 The recommended frequency of transformer oil analysis is dependent on both the voltage and power. The chart on the left can serve as a guideline but does not take into consideration the transformer’s operating environment. If results from a periodic test raise a red flag, the frequency should be increased. Even if the cost of the tests is high, the expense should be compared with the cost of replacing a transformer and the downtime associated with the loss of a transformer. The most common in-service tests are the dielectric breakdown voltage (ASTM D877), interfacial tension (ASTM D971), acid number (ASTM D664), oxidation inhibitor (ASTM D4768 or D2668), Karl Fischer water (ASTM D1533), visual examination (ASTM D1524), and dissolved gas analysis (ASTM D3612). The sampling for these tests is critical. Be sure to follow ASTM D923-07. Any deviation from this procedure may result in test data that does not offer an accurate picture of the condition of the oil or the internal components. It is important to differentiate between normal and excessive gassing rates. These will vary based on the transformer design, insulation material and loading. It is recommended that laboratories use key gas analysis (KGA) supplemented by the Dornenburg and Rogers ratios in analyzing dissolved gas analysis (DGA) results. 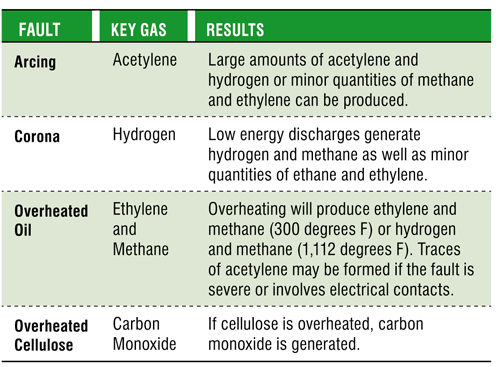 DGA measures the oil for methane, acetylene, ethylene, hydrogen, ethane and carbon monoxide. It can also provide an indication of arcing, corona, overheating oil and overheating cellulose. Other tests that can be performed measure inorganic chlorides and sulfates (ASTM D878) and specific gravity (ASTM D1298). Some of these tests will be conducted by the blender or supplier. These tests will establish a baseline for comparison in future analysis. Keep in mind that it is not uncommon for transformer oils to be in use for 30 years or more, so a little expense on the front end can lead to huge returns in the future.